Everyone who knows me calls me “Radio.” I earned that nickname for one simple reason—I’ve always loved to talk and I don’t have an off switch! I grew up in a small town and have always been happy and full of life. Then, my life changed in the blink of an eye. Like many teens, I was in a car accident, but after that the story took some unique turns. The way I was found, rescued, and “rebuilt,” my near-death experience, a brief visit to Heaven, and my long road back to an active life may sound hard to believe. If I hadn’t lived it, I probably wouldn’t believe it, either. This is the story of Eric “Radio” Redmon, a typical teenager growing up in the small town of Commerce, Georgia. While preparing for his junior year of high school, on June 12, 2003, he lost control of his Ford Explorer and had a wreck that left him in a coma with a traumatic brain injury. 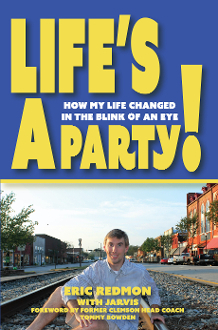 In Life’s a Party, Eric explains how faith, family, and friends helped him to recover, rebuild, and graduate with his classmates. He also shares his passion to help people in need and how he is using his story to benefit others. Eric’s story is one of faith, hope, and love.